More than 40 works are included in Highlights of the Bradley Collection. 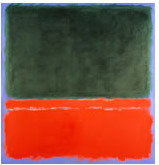 Among the works are Wassily Kandinsky's Fragment I for Composition VII, Center; six Georgia O'Keeffe paintings; and Mark Rothko's Green, Red, Blue. The Museum's popular Bradley Galleries are located on the upper level. This reorganization will allow for the display of one of the Museum's two summer feature exhibitions, The Arts and Crafts Movement in Europe and America, 1880-1920: Design for the Modern World on view May 19–September 5. At the close of the Arts and Crafts exhibition, the Bradley Galleries will be renovated and reinstalled in commemoration of the 30th anniversary of the gift of this important collection to the Museum. The collection will reopen in November/December of 2005. Bradley Collection In 1970 Mrs. Harry Lynde Bradley not only promised her magnificent collection of 20th-century masters, but also the final $1 million toward construction of a new wing to house the expanded collection. Among the masterpieces featured are works by Gabriele Münter, Wassily Kandinsky, E.L. Kirchner, Fernand Léger, Pablo Picasso, Joan Miró, Georgia O'Keeffe, Milton Avery, Mark Rothko, Helen Frankenthaler, and many others which provide the cornerstone of the Museum's 20th-century collection. Mark Rothko, Green, Red, Blue, 1955. Oil on canvas. Gift of Mrs. Harry Lynde Bradley. Wassily Kandinsky, Fragment I for Composition VII, Center, 1913. Oil on canvas. Gift of Mrs. Harry Lynde Bradley. Georgia O'Keeffe, Poppies, 1950. Oil on canvas. MAM, Gift of Mrs. Harry Lynde Bradley.